The llist of participants is topped by David Navara (Czech Republic) and Nikita Vitiugov (Russia), both have a FIDE rating of 2735. 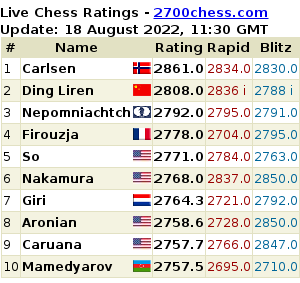 They are followed by Pavel Eljanov (Ukraine, 2727), Ian Nepomniachtchi (Russia, 2714), Etienne Bacrot (France, 2711), Francisco Vallejo (Spain, 2706), Maxim Matlakov (Russia, 2695), Alexander Moiseenko (Ukraine, 2695), Yury Kryvoruchko (Ukraine, 2692), Alexander Riazantsev (Russia, 2688), Anton Korobov (Ukraine, 2687), etc. The rating of the No. 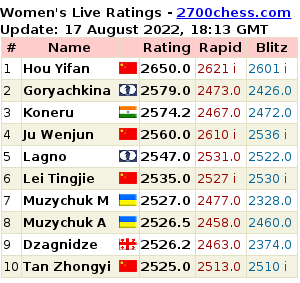 100 in the starting list (Namig Guliyev) is 2536, while there are 256 players total.